When a Secret War ends, a new Marvelverse begins. For those of you who aren’t keeping up with comics recently, Secret Wars was this summer’s latest "big event." In it the Marvelverse collided with the Ultimates Universe, destroying the Marvel universe as we knew it in May, and creating Battleworld a realm ruled by Doctor Doom. Confused yet? 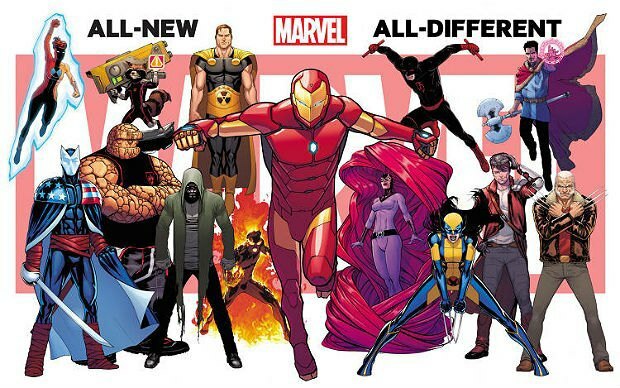 Marvel's All-New All-Different Universe via Marvel. Well you're in luck, "55 to 60 new titles will begin at issue No. 1" starting July 1. This isn't the first time that Marvel has rebooted their universe, nor will it be the last. Marvel did a soft relaunch in 2012 with Marvel NOW! and an even softer one in 2013 with All-New Marvel NOW! 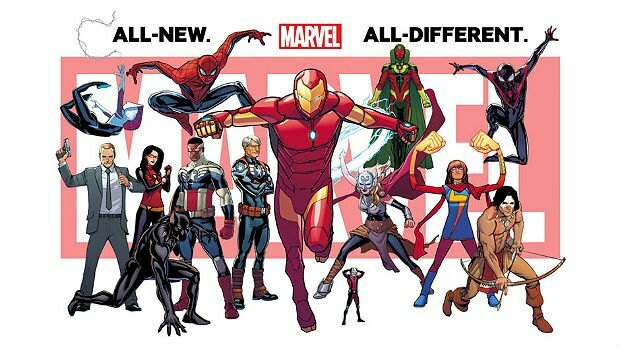 Marvel's All-New All-Different Universe via Marvel. Invasion of the Spider-People! There’s two Spider-Women (Jessica Drew and Gwen Stacy), and two Spider-Men (Peter Parker and Miles Morales)! Scott Lang is Ant-Man which is clearly a blatant tie-in with the Ant-Man movie slated to be released July 17. Sam Wilson (formerly The Falcon) stepping in as the new Captain America. And if you thought people were pissed about having a female Thor, just wait until they realize we now have a black Captain America. As for the original Cap? Looks like there’s going to be a 90-year-old depowered Steve Rogers. Laura Kinney (aka X-23) gets promoted to Wolverine-status. This isn’t surprising, considering that she’s his genetic clone, and has played a huge part of the Wolverine titles. Also worth noting is the grizzled looking Wolverine on the far right. That’s “Old Man Logan” of the eponymous series, the last living superhero in a world run by super villains. Naturally, all of that takes place in an alternate universe. However, now that it appears that OML survives the Secret Wars and is folded into all-new Marvel Universe proper we have a surplus of Wolverines giving credence to my theory that multiple Wolverines is the only explanation as how he appears in so many titles. Ben Grimm (aka The Thing) is no longer wearing a Fantastic Four uniform (RIP Fantastic Four) but rather a Guardians of the Galaxy one. Considering that Star-Lord isn’t wearing his GotG insignia, this could mean a shakeup in that franchise, with Grimm possibly replacing Peter Quill. And finally, Daredevil has a brand new black costume with red accents. Possible nod to his Netflix series? Well done, Marvel.